3 day production on these promotional carabiners that are so unique they are patented (US PAT D527988). They give you more than twice the engraving area as compared to classic carabiners. Yes, the design remains clean, and allows your message to really stand out on both the 80mm (3.125 inch) and 70mm (2.75 inch) size. 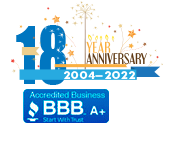 LogoBeener® Promotional Carabiners: Now you can boldly display your logo and/or multi-line message on one of the consistently best values in promotional products available. These promotional carabiners give you more than twice the engraving area compared to classic promotional carabiners. The design remains fluid and clean, and allows your message to stand out superbly on the 80mm (3.125 inch, right) and 70mm (2.75 inch) LogoBeener® (US PAT D527988). 2X engraving area size is just part of the story of this premier promotional carabiner. How to make them an even stronger performer? By having them arrive to you with BOTH SIDES laser engraved, for just .20 per for the reverse side. Get 4x the promotional impact! U.S. lab certified lead-free: as with every carabiner we produce, our LogoBeener® promotional carabiner is made of safe, lead-free series-6000, aircraft-grade anodized aluminum, providing a tough, resistant, shimmering color and finish (with custom PMS color matching available at no charge on all orders of 20k+ pieces). Superior engraving, superior promotions: Naturally you demand that any promotional item with your company's name or organization on it look it's absolute best. That's why we are proud to say our promotional carabiner is fiber laser engraved — inclusive in the price — providing a permanent, bright and exceptionally crisp engraving, as opposed to silk screening or "printing" which can flake or scratch off, or inferior Co2 engraving with less scan lines per inch. Additionally, all our promotional carabiners feature strong, crisp clips and a silky smooth opening and closing action, providing an overall solid, quality feel in the hand. As is well known, and for a variety of great reasons, promotional carabiners are very popular for marketing businesses, as a way of growing brand awareness, and just getting a message "out there' where it is consistently and conveniently seen. And, at Wholesale-Carabiners.com we are a leader in producing quality, attractive promotional carabiners in unique, and innovative designs. Let's look at the LogoBeener™ — the unique design of LogoBeener™ carabiners produced by Wholesale-carabiners.com allow twice the engraving area as compared to classic carabiners. It's got double the engraving area height of traditional carabiners, which means you can actually scale your logo up to 4 times the area — a .18 x .18 logo can become .36 x .36, for instance, which takes up 4 times the area than previously sized. This large area really allows our customers to get their message printed clearly especially it the art is complex, and boldly, all the while maintaining the clean and fluid design of the carabiner. We use series-6000 aircraft grade aluminum alloy as the base metal for manufacturing carabiners and ensures that all its products are lead free. We always use high quality YAG laser technology to print (engrave) names, logos and other promotional messages on all our products. The laser printing (technically engraving) produces bright white / silver permanent impressions on our carabiner products. We offer our LogoBeener carabiners in two sizes: 80 mm and 70mm. Other than having a unique design for allowing a double display area, at wholesale-carabiners we also offer engraving on the reverse side — and, at a cost effective price point. Considering the front alone has double the normal area, this quadrupled message area allows our customers to print their names, logos and a few line short messages on their promotional products freely with much less constriction. We also offer eight vibrant colors and offer free custom PMS color match for an order of above 5,000 units. 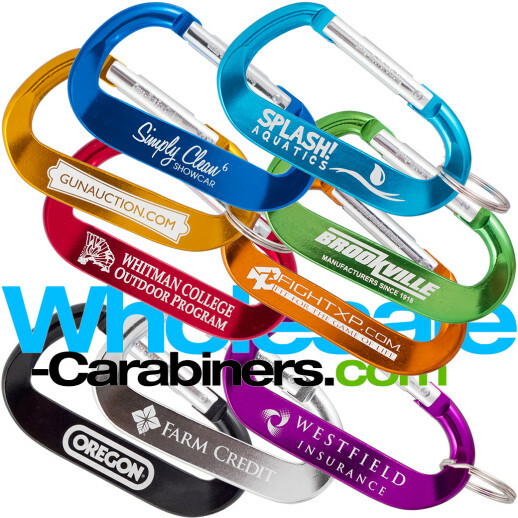 Wholesale-Carabiners.com endeavors to give customers the best value for their marketing money. We offer an unbeatable price, yes, but rest assured without compromising on quality. Our carabiners can be accessorized with key rings, medallions, and straps. And at Wholesale-Carabiners.com we are adept in handling bulk products and via streamlined production we deliver most of our carabiners, safety whistle and other orders within industry leading timeframes. Pricing for all products including our custom engraved LogoBeeners is available for qtys. of 10,000 - 500,000+. Please call for same-day quotes.